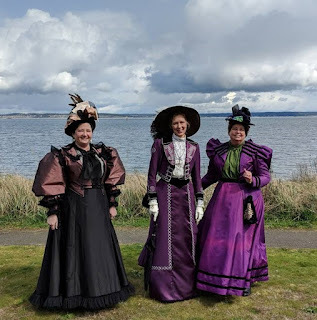 A few months ago, I began planning my outfit to wear to the Port Townsend Victorian Festival in Washington, where I go every March when I visit my Mom. 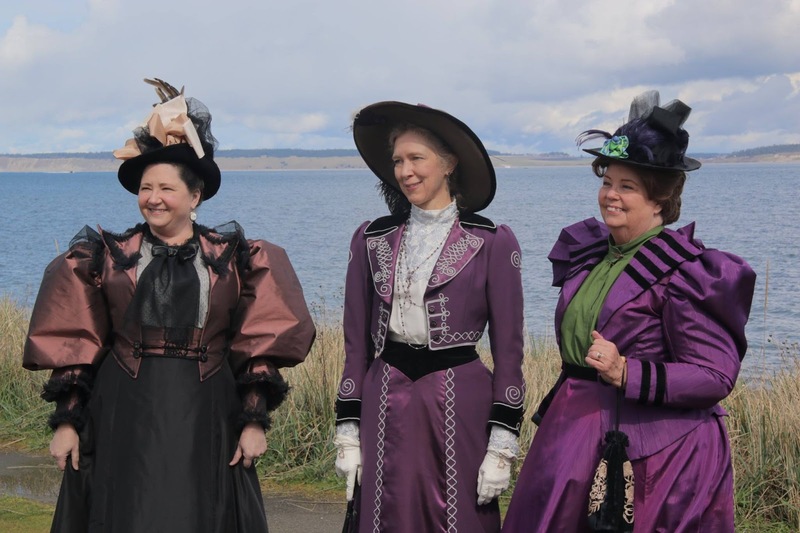 My group of friends I go with, and participate in the fashion show, were talking about wearing 1890s this year. 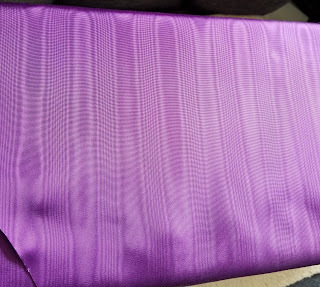 I had started an 1890s walking suit of a plum moiré fabric that was given to me a few years ago; 10 yards of it, to be exact. It had some fading on the folds but when I looked at it near my waist and knees, it made it look Ombre, so I decided to just go with it. 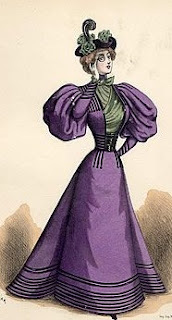 I remembered a fashion print of a purple walking suit (pictured at the top of the page) that caught my eye with its contrasting olive-green blouse. I thought this would be very dramatic and the black striped trims would be fun to work with. 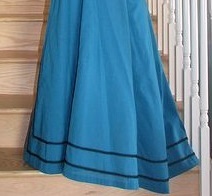 After I cut out the skirt and sewed up the sides seams, I found an “oops”. 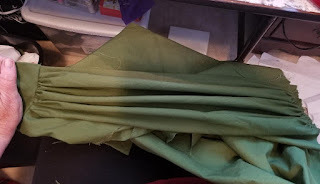 On the backside of one panel, I hadn’t checked that the fabric extended all the way to the edge of the pattern where I cut it, and there was a chunk missing. 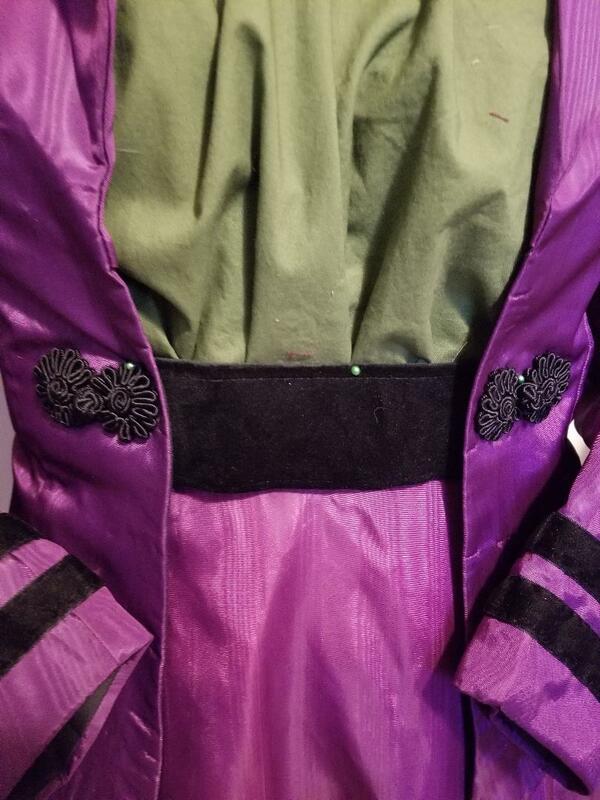 So, my options were: cut out a new panel, because I had plenty of fabric left, or, sew a strip of fabric to it and cover that seam with rows of black trim around the bottom. I found a couple other photos showing this trim idea and decided not to waste any more fabric and do the trim. Except when I put the skirt on my dress form, the skirt was a lot longer than I thought, so I was able to just trim it shorter and that “oops” disappeared. 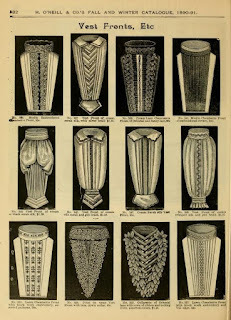 But the idea of the rows of trim stayed. 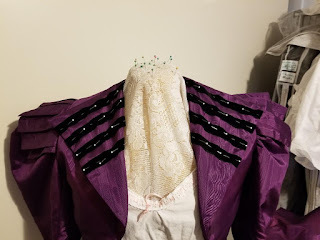 I also looked for ideas to trim the lapels and cuffs. 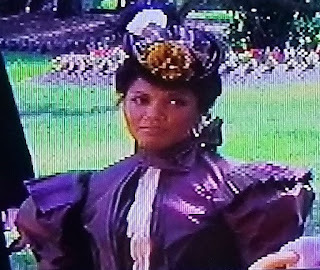 I’ve had a dream of doing a fancy design of black soutache on a jacket or the lapels but when this needed making within 2 months, I knew this wouldn’t be the one. 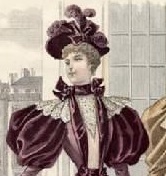 Besides, I wanted to have my black velvet ribbon trim around the skirt, not soutache. 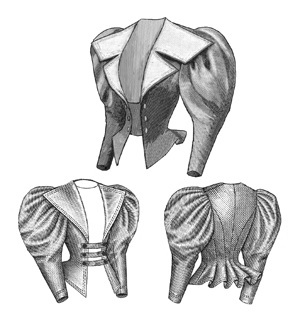 And I liked a belt idea with the jacket hooked at the sides, and also that pleated vest front to wear under the jacket. For my skirt, I used a pattern I’d made before; Truly Victorian #291 (1898 Walking Skirt). 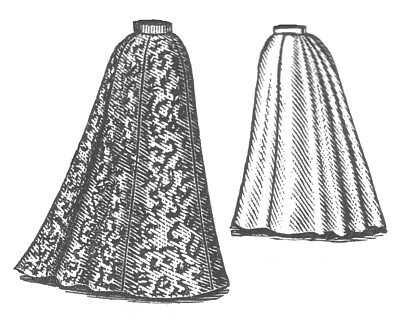 It has smooth panels in front, with a group of narrower ones in the back that are pleated into the waistband. 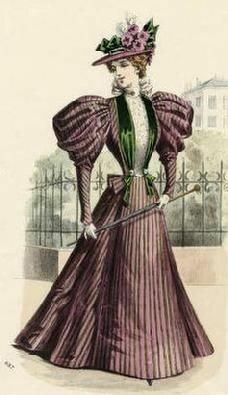 The jacket would be Truly Victorian #496 (1896 Ripple Jacket). 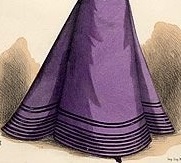 The “Ripple” name comes from the rippled peplum in the back. 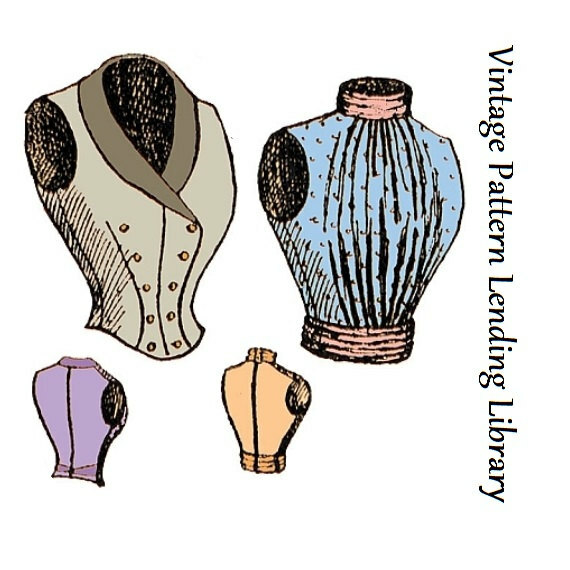 I made my vest from VPLL (Vintage Pattern Lending Library) #672 (1897 vest). These can be purchased on Etsy. Vest fronts were all the rage of the 1890s. 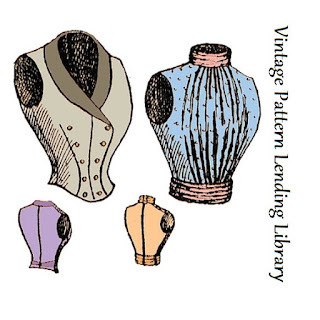 The VPLL pattern had the gathered front I wanted, although I changed it to have it close in the front but it wouldn’t show with the gathers. 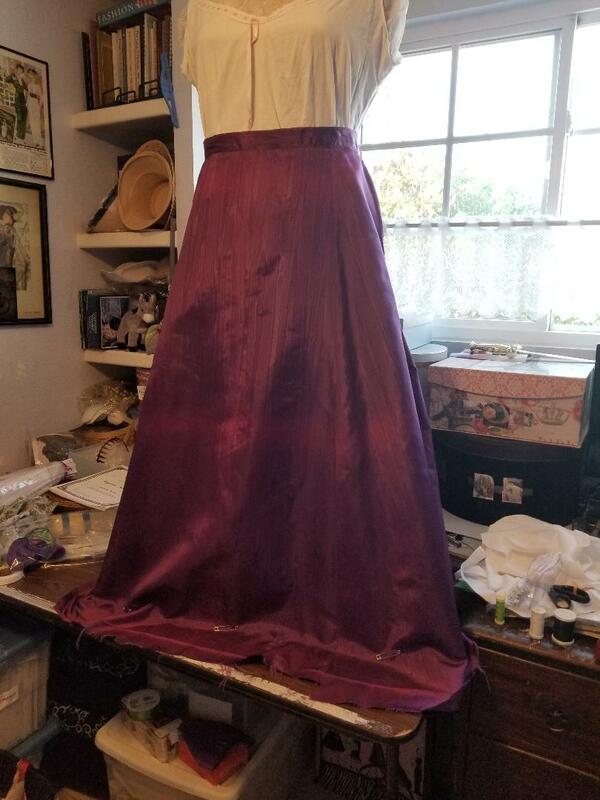 It only goes up to a certain size so I added a few inches to the sides and with the loose fit of the front, it was pretty easy. I found my dark avocado-green cotton fabric at JoAnn’s. 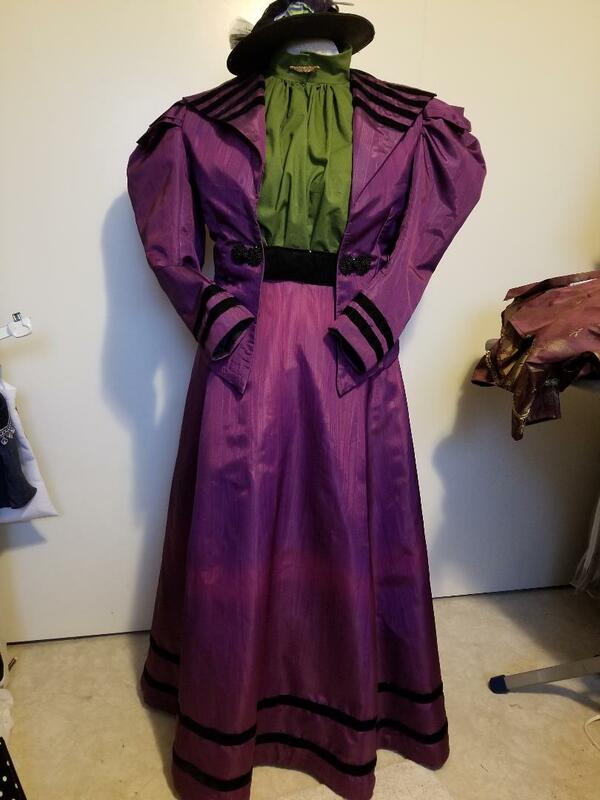 The whole time I was sewing this, I was constantly checking different sales groups, and on ebay/etsy for a one-inch wide black velvet ribbon. Lots of it, like 12 yards. It’s not easy to find, not even in the stores. Everyone has really narrow stuff. Finally, I found some 5/8” wide ones and decided that was the best I could do, and, they had 9 rolls of 2 yard rolls, with a total price of $6.50. Can’t beat that! 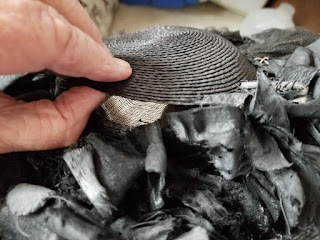 Once I sewed the black cotton flatlining in the jacket, the inside of the lapels folding out showed black and for a few minutes I considered doing a solid black velvet lapel, like this one. But, naw, the stripes would be more fun. I finished lining those lapels with the plum fabric and pinned the rows of velvet on, then machine-sewed them along the edges. My sewing machine didn’t like that much and we argued about the loopy threads under the fabric a few times, but this was a precursor to my machine blowing out an electrical panel a couple weeks later. Guess who won that argument? Due to time restrictions, we came to a draw and backed away for a later date to re-do it properly. 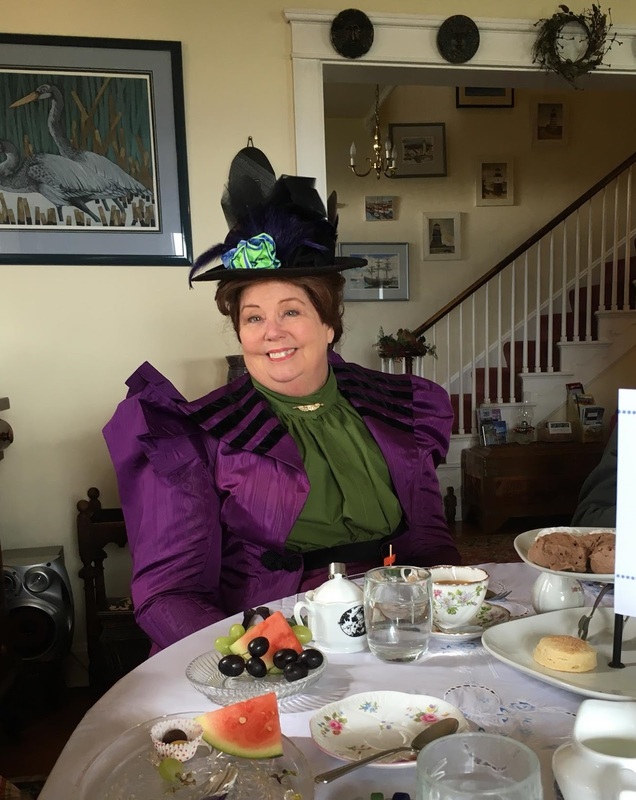 Did you notice the “wings” on my upper sleeves? 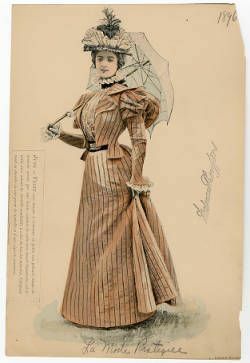 That came from an idea of a dress I saw on a TV program, but the funny thing was, only her left shoulder was totally pleated with very crisp knife pleats. 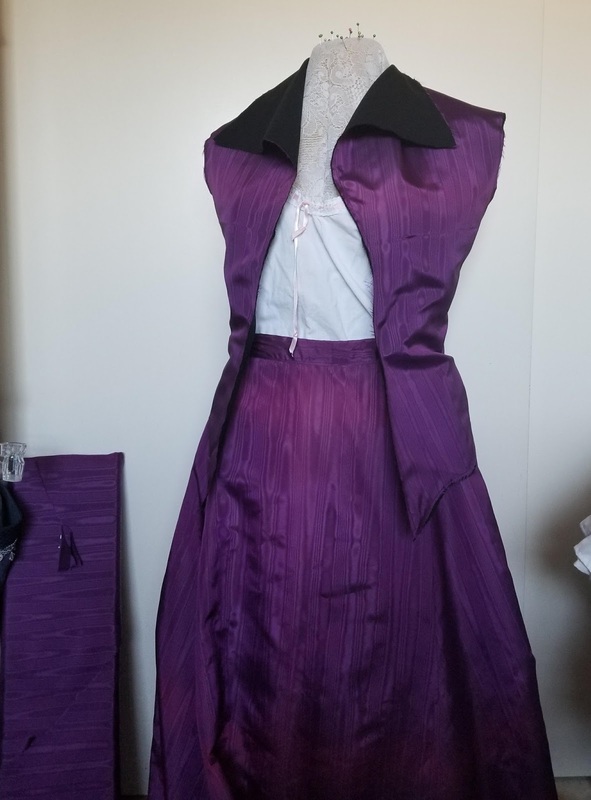 The right shoulder started with some pleats in the back and ended up with just a wave in the front. Can we say, ”Oops”? These were pretty easy to make. I cut a panel that I folded in half, and then knife pleated it, letting the outside pleat bend a bit so it would curve. I pinned it on top of my sleeve cap before I sewed my sleeves in, so it was all one piece. I saw another version of this with lace and want to try that someday too. 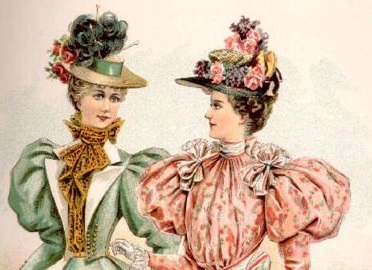 I’m on an 1890s roll right now. 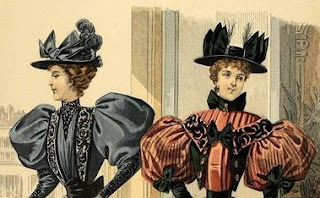 Wait till you see my next post! 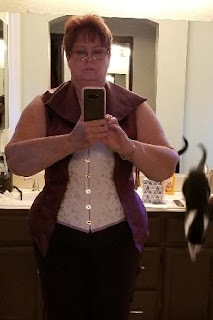 Back to the jacket; now the sleeves are in, which like the last '90s blouse I did, have two layers of heavy netting in between the fabric and flatlining. Besides the velvet rows on the lapel, I also did two rows on the sleeves. 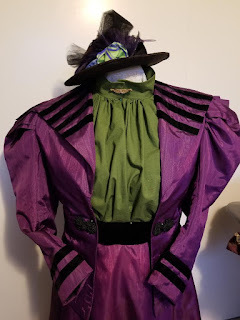 I wanted to do a chevron-design with them but the sleeve cuff openings were so narrow, I couldn’t get my sewing machine in there to sew them. Methinks this would need to be hand-stitched for future reference. I also began sewing a black velvet belt that I used 2 layers of buckram inside it. 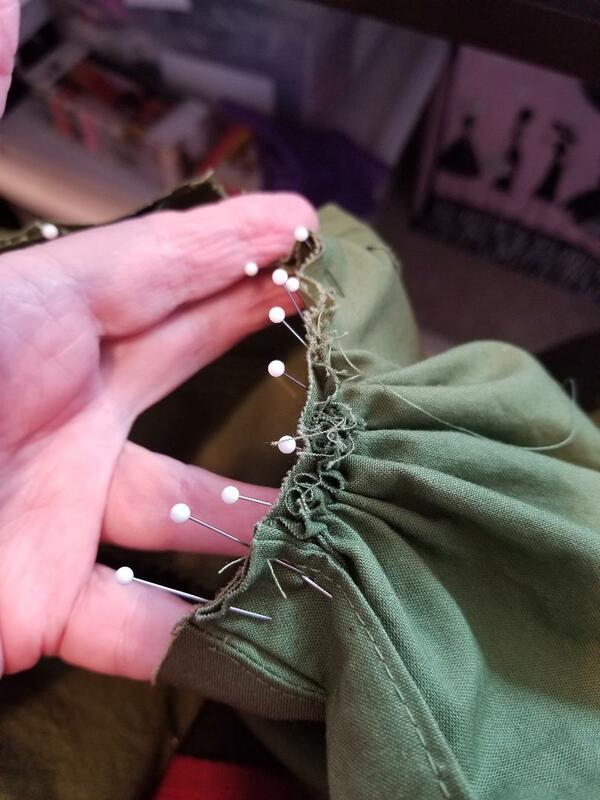 But when I placed it on the skirt and pulled the jacket closed, I realized that the plan I had of two decorated buttons on the front of the jacket that would have a hook inside to connect to a bar on the skirt waistband, wasn’t going to work. I couldn’t even stitch through the buckram to hold the bars on if I wanted to. So Plan A didn’t work. Plan B wouldn’t work with the belt. So, Plan C was to sew a band of velvet over the top of my skirt waistband and fake a belt. Now I was able to sew some bars on it to hook the jacket to. And while digging in my stash for two large buttons, I found two black frogs that I’d found somewhere, and those became the decorative addition to it. I also decided to wear one of my antique bar pins on the neck closure. 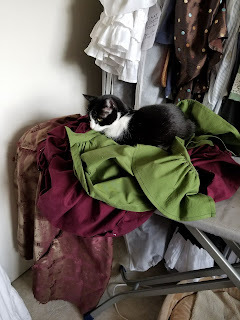 Chloe managed to be very helpful every time I laid anything down for just a moment. So now we need a hat. 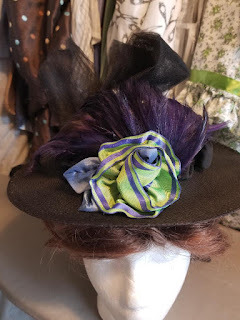 Looking for hat ideas and trims are fun. 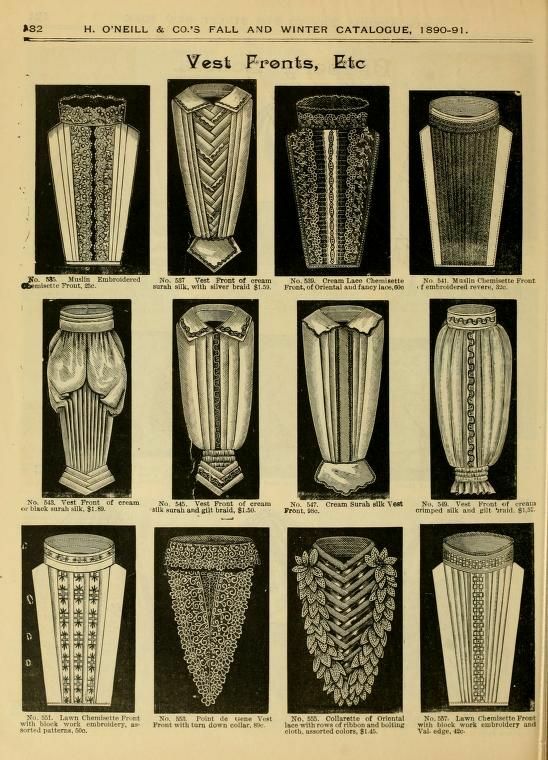 Find the hat base not so much. 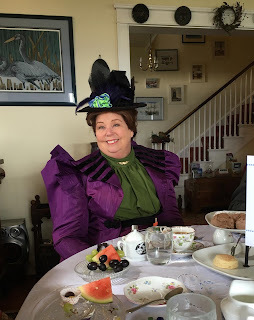 I decided to go for a fancier version of a boater, but with a flat crown, and in black straw. I wasn’t having much luck finding a hat base that I could alter in the short period of time I had, and we’re talking 2 weeks left before I was leaving town. 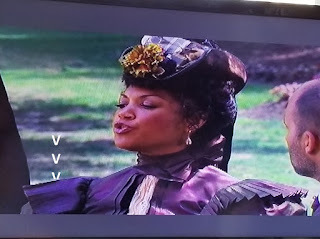 Again, for speed’s sake, I bought an antique hat on Etsy that needed some loving care. I removed the pieces of shattered black silk around the crown and found that some enterprising lady back then had cut down a taller crown to make it flat, and hand basted them together. But it was pulling apart. So, I did some hand basting on it myself to strengthen it. 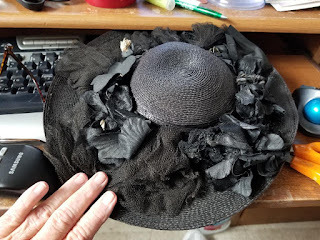 I did save the silk and whatever else was on the hat in case I ever need it for another hat, but it’s pretty dried out. To also save that crown, I basted a piece of black velvet over it. 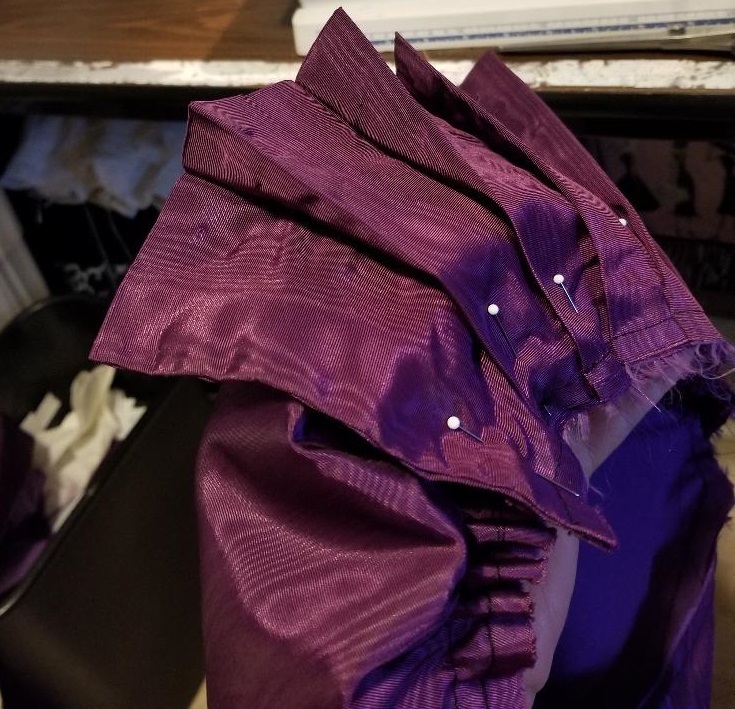 At this point, I failed take anymore photos of construction since I was in “Speedy Gonzalez”-mode, but I folded a length of black tulle into two folds with a “tail” sticking up and basted those to the velvet cover. They stood up nice and straight as little soldiers, just like the '90s hats like to have. 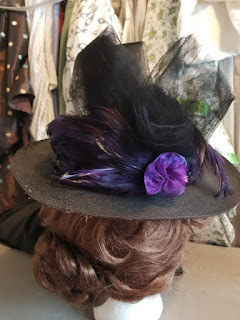 From my stash I pulled out three little purple feather pads and laid those in the front and over the crown. 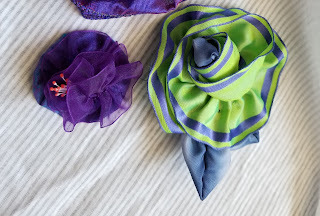 And finally added two silk ribbon roses to cover where things were attached or looked wonky. I bought those in the Marketplace at Costume College last year. Everything is basted on so they can be removed or moved if needed. And finally, it was all done, 3 days before the event in Washington. 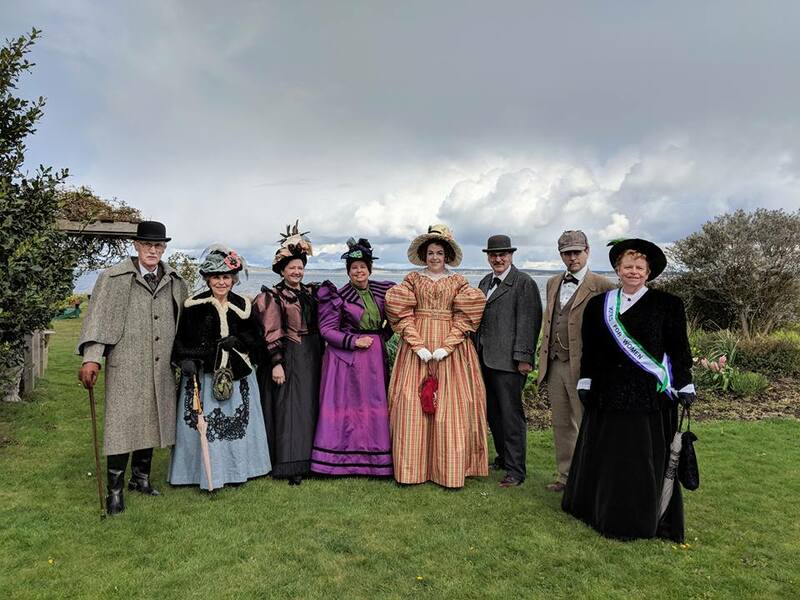 My group of friends has our usual photo op on the beach after our tea at the Commander’s Beach House. My little “wings” had a life of their own and often were standing up when I wasn’t looking. And since I couldn’t reach them, I was using either my hairbrush to push them down, or whatever else I could find when out in public. It was a purple year for three of us. This is part of our group of models who went to tea that day. It was quite chilly, and we even had hail earlier that morning but as usual, we were pretty comfortable. The amazing thing is the camera saw some blue in my purple fabric, and read it as white, so it gave a totally different look to my dress. 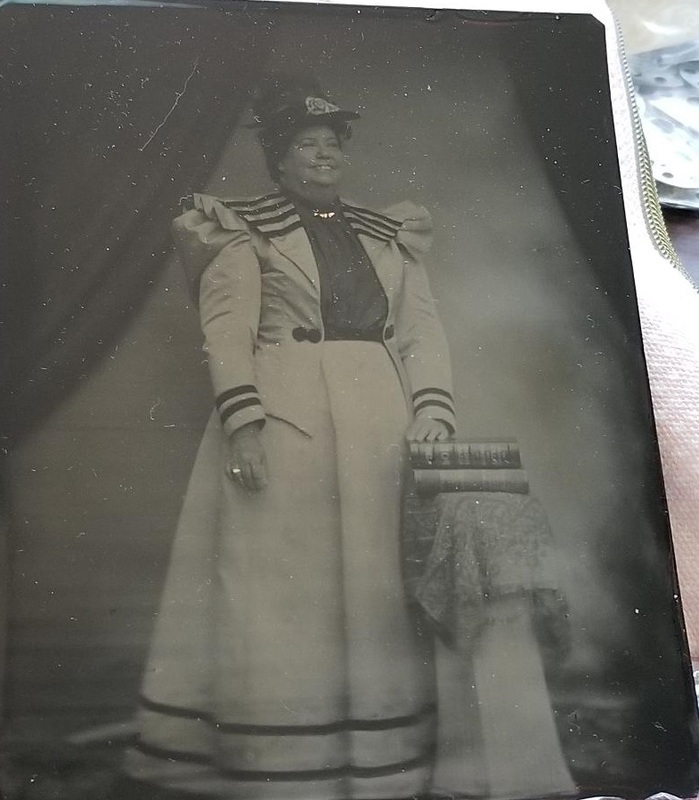 This is a photo of my tintype, so it’s not really great but the tintype itself was.